It's been almost two months since I finished the book. I shouldn't have waited this long to write this review. At first I put it off hoping I'd come up with something interesting to say about it if I just let it percolate for a bit. And then I put it off because I'd already put it off for a while and I had other books I'd rather read and review. But it's been sitting in my drafts folder long enough, so for what it's worth, here are my almost-two-month-old thoughts on The Bone Season by Samantha Shannon. First of all, it's incredibly unfair to saddle a debut novelist with a title like "the next J.K. Rowling." It puts her at a disadvantage right from the start and sets expectations so high that it is inevitable that she will not be able to live up to them in the eyes of many who will (unreasonably) expect the emotional engagement of the entire Harry Potter series, including the catharsis of a decade's worth of investment in the characters, to be crammed into a single book. 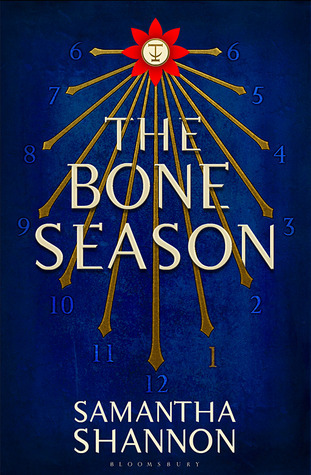 But The Bone Season suffers under more than outsized expectations. It groans under the weight of the author's own broad ambitions. There's something for everyone! Fantasy and science fiction (which are not one and the same! ), aliens and magic, dystopian future and social commentary, action, betrayal, intrigue, romance. Did I leave anything out? Set in London about 50 years in the future, the story throws the reader into the deep end immediately. I'm all for world-building, but Ms. Shannon overwhelms the reader from the get-go with complex, inter-related societies, social and governmental hierarchies, various classes of clairvoyants with a dizzying array of mental powers, and tons of new terminology. And then, just a few chapters in, our young protagonist, Paige Mahoney, is captured and tossed into a completely new setting - Oxford this time - with a whole different set of rules. Simply put, it was confusing and I spent more time trying to sort these two worlds out than getting into the characters and the story. As a result, I just couldn't care as much about Paige or any of the others as I knew I was supposed to. Perhaps it would be better on a second reading with a bit of familiarity and if I hear good reports of the second book (out of a planned seven), I may give it another shot.